Quick, what's the first thing you think of when I say, "compare and contrast?" Okay, let's hear it. Who said, "Venn diagram?" I'm wondering how you truly feel about Venn diagrams. Maybe you love them. Maybe you use them with great success. For me, I have mixed feelings about them. 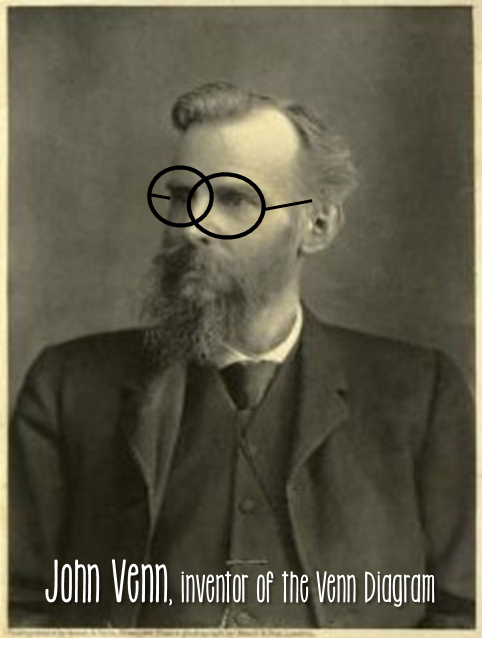 Cover your ears, John Venn, inventor of those overlapping circles. I have a love/hate relationship with you. Venn diagrams make me a bit anxious. On one hand, I really do like them as a symbol, because it's such a universal sign for comparing and contrasting. But on the other hand, I find them limiting (and sometimes even--GASP--a hindrance) for recording thinking in an organized and deep way. My biggest beefs are (1), that darn middle area is always too awkward or too small to write in, and (2), the outer areas I find difficult to keep organized. Now I don't want to come across as totally anti-Venn. But I do want to toss out some alternatives, because in trying to provide students with "vehicles" to tackle this skill of comparing and contrasting, Venn Diagrams will usually take them somewhere, but what follows may take them further, or take them through a different lens, or from a different angle. So here are some ways to compare and contrast two (or more) topics without a Venn Diagram. The "Everybody and Nobody" strategy plays on the idea that some similarities and differences are pretty obvious, and some are not. So I like to ask students to find a similarity and a difference that everybody would think of, and then find a similarity and a difference that nobody would think of. I like this strategy because it has built-in differentiation. Often, my struggling students will succeed in finding great "everybody" similarities and differences, and my higher students enjoy the challenge of finding the unique "nobody" similarities and differences. The following notebook page is one way I've had students organize this strategy in writing. It's only been recently that I've really started using analogies with my students as a means of comparing and contrasting. 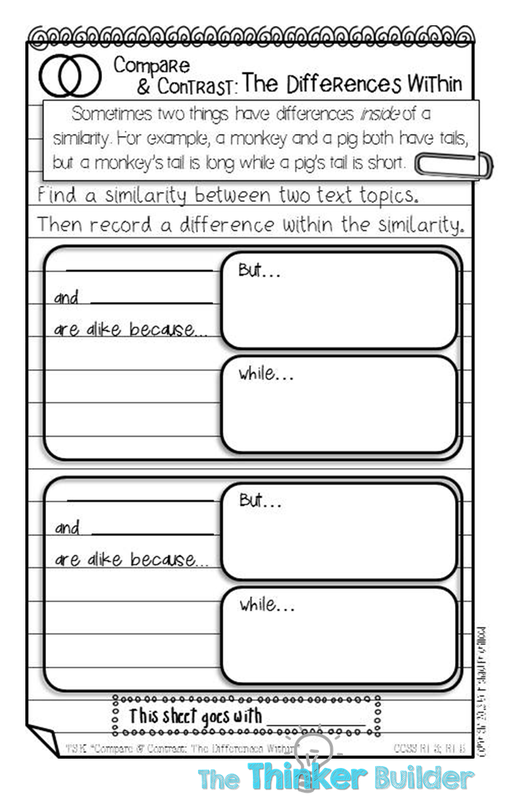 I use this strategy more often with literature than informational text. With an analogy, students take an element or idea from the text and compare/contrast it with something seemingly unrelated, from outside of the text. For example, I'm reading The City of Ember to my third graders, and the other day I stopped and asked my kids, "How is Doon (one of the main characters) like a fork?" Now I got some seriously crooked heads and confused looks at first. But after thinking and talking, we actually came up with several ways Doon was similar to a fork: he can be a bit sharp with his words, like a fork has some sharp parts; and Doon is good at trying to solve problems, like a fork is a tool that can help you solve the problem of picking up food. After we also discussed ways Doon was not like a fork, I then asked, "If Doon is like a fork, which utensil is Lina (the other main character) the most like?" Analogies can be a bit tricky because they can often fall apart quickly, and some students really struggle to think in those nonliteral ways, but an analogy can also really push your students to think differently than they are used to doing. 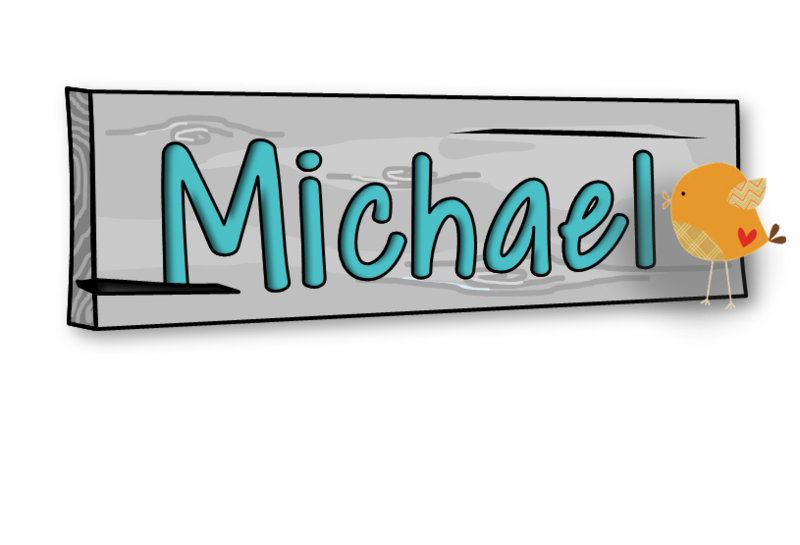 Here's a strategy that's probably not brand new to the world, but here's my take on it. It embraces the fact that often two topics will have a similarity on one level, but within that similarity are differences. And so identifying that similarity is important, because it serves as a framework to dig deeper to discover differences. My students were doing this just a few days ago with an historical fiction text where the character visited a cotton field and a cotton factory. 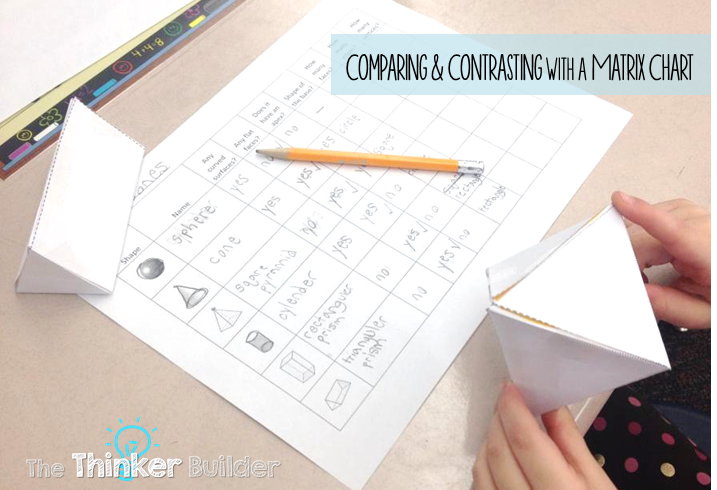 We used "The Differences Within" strategy to compare and contrast her observations. For example, in both settings people handled cotton, but within this similarity are differences, like how in the cotton field, the workers picked the cotton with their hands, but in the factory, the workers used machines to turn the cotton into yarn. On the following notebook page, you can get a sense of the strategy's structure, with the similarity being a larger box, and the two smaller boxes inside it meant for the differences. When you are trying to compare and contrast several things, a matrix chart is really helpful. It's basically like a spreadsheet, with several rows, one for each topic to compare, and several columns, one for each way you are comparing. My math students used this strategy when we were comparing and contrasting features of three-dimensional shapes. I've found that while students are actually filling out the chart, it's difficult for them to be thinking of similarities and differences amongst their topics. 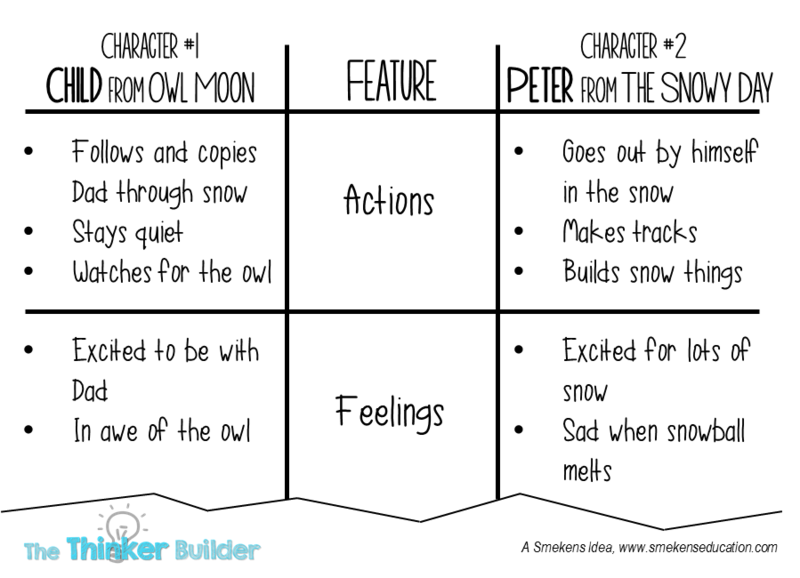 But after they have the completed chart and they can step back and use it as a tool, it can help students notice things they may not have otherwise noticed. Alright, now don't get me wrong: I've been known to criss-cross some hula hoops on the board and slap some post-its inside of them a time or two (wink, wink, Mr. Venn). 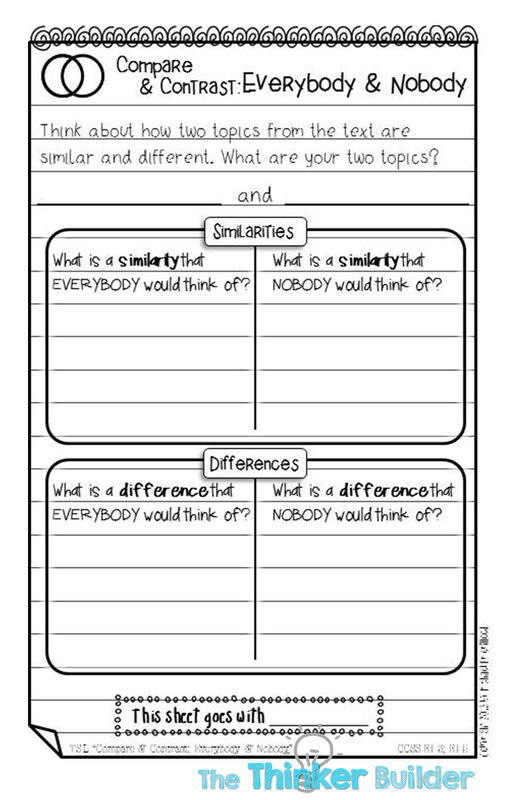 But hopefully you've now got another tool or two to pull out with your students for comparing and contrasting.